While gamers are still waiting for the all-new Atari VCS to become available (pre-orders have ETA of July 2019), Atari UK has launched a couple of new retro consoles which include 50 classic built-in games including the likes of Asteroids, Pong, Centipede, Missile Command, Breakout, Millipede and more. 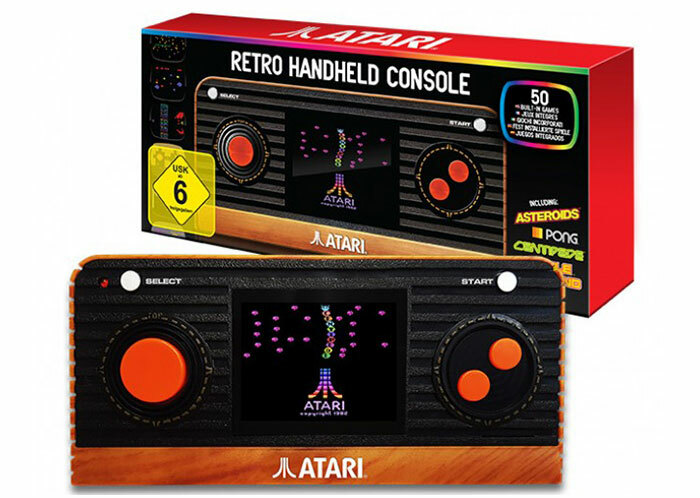 There's a new All-in-One console in a joystick design (£24.99), based around the angular and uncomfortable - but iconic - Atari design, and an all-new handheld design (£34.99) with built-in screen. The Atari 'Retro' Handheld is available for pre-order now and includes some nice design touches to embody the spirit of the 2600 into this portable format. The screen is rather small at 2.4-inches but there isn't a lot of detail to see in the output of a 2600. In the video and various promotional images the screen looks appealingly contrasty and sharp. The main surface of the console front has a black grooved finish, typically included in consumer hardware for cooling / ventilation, or to protect speakers, but is hardly likely to be used for either of those functions here. Top left and right you get the select and start buttons and below each respectively is the directional controller and a two-button pad. 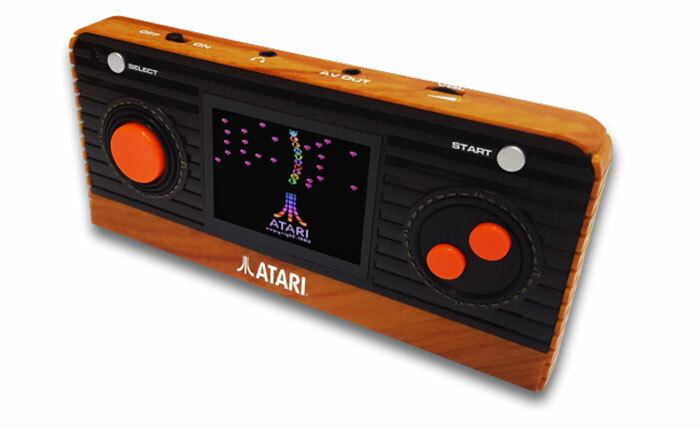 On the bottom bezel of the handheld is the Atari logo in white on a nice 'wood' veneer finish. A glimpse of the edges of the console in the video shows the wood veneer style finish extends to the sides and on top there's a power switch, a headphone jack, some kind of AV port, and a volume wheel. Atari says the buttons are 'responsive' but I think the directional thumb controller will be painful after prolonged use. That raised edge with little movement when prodded in the video would not make my thumb happy. Another concern with any portable will be battery life. No indication is given in the promotional pages of how long the AAA batteries required (not included) will last, but at least it is easy to source either regular or rechargeable varieties and you can have a spare set in your bag. If you are interested in the Atari 'Retro' Handheld it is pre-orderable and you get a free Atari Limited Edition Centipede Coin with your purchase. A full list of included games is available on the pre-order page too. wonder if they could get that screen any smaller? the screen is way way to small kills any intrest I had in it . I'll wait for the N64 Classic Mini, which hopefully is late due to sorting out certain intellectual property rights.